This is the weekend we have been working toward all year, September 23 & 24. We have more than two dozen extraordinary artists presenting work for you; glass (blown & stained glass), fabulous paintings, jewellery, pottery, ceramics and textiles. There is a cluster of locations in the east village of Port Credit and another group of locations in the west end of town. 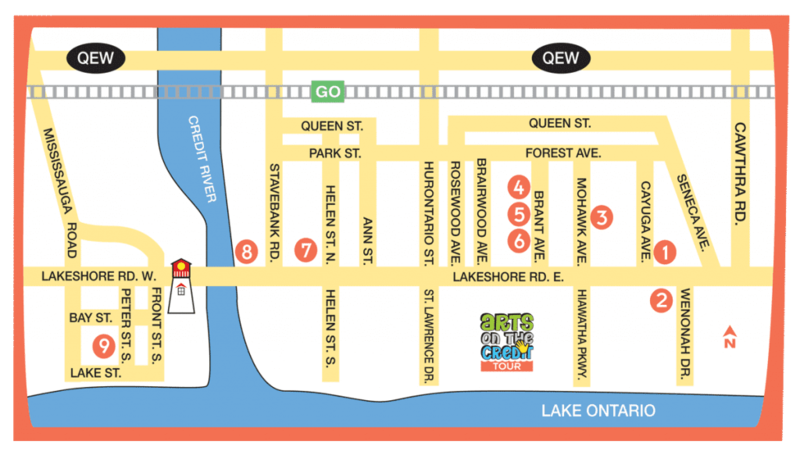 You can walk each area & just move your car once or since the weather promises to be perfect, you might want to walk & explore the whole of Port Credit. Be sure to stop along the way for refreshments and nibbles. There are many great restaurants all along Lakeshore Road in Port Credit, many with patios. Call up your friends and make a day of it or do part of the tour Saturday and the remainder on Sunday. The generous artists participating this year have donated spectacular draw prizes for those completing the entire tour. Be sure to pick up a ‘tour passport’ where ever you decide to begin this adventure. Each location will also have tour booklets for you. Here is the list of locations for our 2017 art tour. Ladybug Harbor 7 Mohawk Ave.
Pazan Gallery 6A Brant Ave.
Splash of Charm 6B Brant Ave.